Doctor Who @ 50 Two writers stand at opposite ends of the Doctor Who anniversary - cult graphic novelist and author Neil Gaiman and veteran TV man Terrance Dicks. 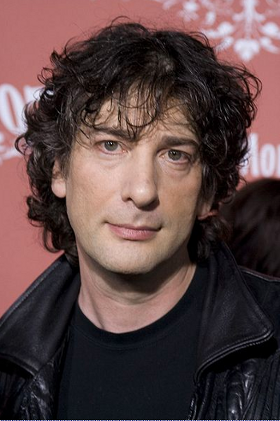 Gaiman contributed two pieces to Doctor Who. One is the tale that personified the TARDIS as a woman named Idris, lending flesh to the love of the Doctor's life and articulating an intense and eternal relationship that could never be physically consummated. The other, in May this year, opens a Matrix-esque entomological note to the Cybermen story. Dicks wrote many episodes between 1969 and 1974, with 70 Who novelisations to his name. He's best known for cranking out the epic 10-parter The War Games. If anybody knows Doctor Who it is Dicks, whose Time Lord was more time buccaneer than time anguisher. The Reg: You're the multiverse-minded storyteller whose Who credits include 2011’s The Doctor’s Wife. Are you preposterously excited at the prospect of the fiftieth anniversary episode? Neil Gaiman: I actually am. I love it so much, especially here in the fiftieth anniversary year. It’s magic. Amanda [Palmer, Gaiman’s musician wife] and I are doing An Evening With Neil And Amanda in New York on Saturday, but because of the magic of the international dateline I will be able to go and see the fiftieth anniversary episode in 3D in the cinema, simulcast with the UK, in the afternoon. I love that. And I think the possibility that I will get through that live show without saying something about Doctor Who is zero - it will definitely happen. The Reg: Without wishing to grovel, The Doctor’s Wife is one of the outstanding recent episodes. Gaiman: Matt Smith is a puppy, Peter Capaldi is "Hartnellian"
NG: I felt really, peculiarly honoured to be allowed to write that, and to have been allowed to go and play in the Doctor Who sandbox. I’d had this story in my head and Steven Moffat [writer and later producer of the new Whos] just let me go with it. And when it looked like they couldn’t actually afford it in the first season, rather than try to do it on not enough money, and in a hurry, they bumped it to the next season and gave it lots of money. So we actually got to do it properly. I was just so lucky with that – we had a great director, wonderful actors and I got to use all of the things I’d ever wondered about the TARDIS since I was three. The Reg:The main one being? NG: I think I must’ve been about eight when I decided that actually what the TARDIS did was it went to, you know, where the Doctor needed to be. Getting to put that line from eight-year-old Neil into Doctor Who was fantastic. Because we all kind of knew it, there wasn’t anybody who watched The Doctor’s Wife and said: "This is not true!" Everybody said: "Oh yeah – that’s how it works." And the lovely thing about it is, it kind of ever so slightly changes everything that went before... but it doesn’t. The Reg: Peter Capaldi looks like he’s going to make a very convincing Doctor – he is just him. NG: It’s one of those ones. And he’s the perfect Doctor after Matt Smith. Matt Smith’s such a puppy, and you know what whatever Peter does he’s going to be a wise old dog, and I think we need one of them now. There’s something gloriously Hartnellian about him, and it’s nice, that idea that it’s somehow gone full circle. An Evening With Neil Gaiman and Amanda Palmer is available here. The Reg: Forty-four years after you first wrote for it, and fifty since its début, how has Doctor Who survived? Terrance Dicks: I’ve always said that the reason for its success is its variety. The show constantly undergoes change, whether major or minor – getting a new Doctor, the changing companions – and if it’s working it just carries you along. It evolves like a living thing, in fact, but the continuity and the central thread of the show is the Doctor, who is always the Doctor, with the same characteristics and attitudes, ideals and morals. The Reg: Was this part of your plan when you became script editor? TD: My plan was to get the bloody show out, on the air! When people asked me: "What were your aims and ambitions for the show?" I’d say: "That the BBC did not have to show the test card at 6pm on Saturday night." When I arrived [Dicks was appointed assistant script editor in 1968], the script situation was fairly diabolical and chaotic – they were very often late, and shows were falling through. The most extreme example of I can think of is when a four-parter and six-parter had fallen through, and [script editor] Derrick Sherwin came into my office and said: "Terrance, we need a 10-part Doctor Who and you’re going to write it and we need it next week." I exaggerate slightly but not much. I called Mac [Malcolm] Hulke, who’d been my friend and mentor in the business, as it were, and we wrote The War Games together, a script every two days. Obviously, it’s madness to do a 10-part Doctor Who!